A parliamentary committee early Friday approved a bill proposing a set of constitutional changes, including a switch to a presidential system of governance in Turkey. 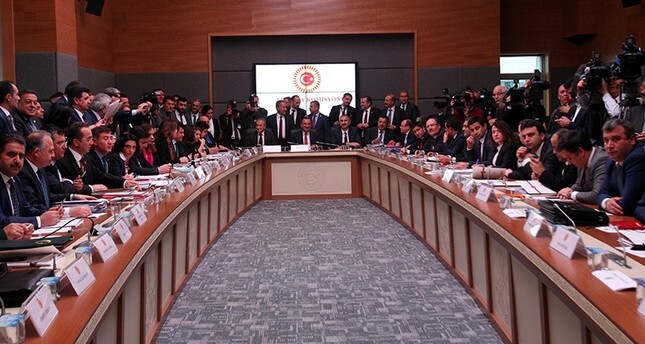 The bill, backed by the ruling Justice and Development (AK Party) Party's 316 lawmakers, is now expected to be put to vote in the parliament after the committee's approval came following nine days of talks. The proposed law gives executive powers to the president and vice presidents while abolishing the post of prime minister, lowering the age of candidacy for parliament from 25 to 18, and increasing the number of parliamentarians from 550 to 600 in accordance with the country's growing population. It also proposes to hold general elections every 5 years, instead of the current every four years, and the presidential election will also take place on the same days. The draft bill also proposes the Turkish president should be at least 40-years old; gets directly elected by the people every five years and will be limited to two terms. The president would also not be required to leave his or her political party once elected unlike in the previous constitution. The president will also be able to appoint presidential aides and the ministers on his or her own, and will also have the right to unseat them. Also, there will be no "Council of Ministers" but there will be ministers. Moreover, the president will have both the executive power and authority within the limits of the law. The number of the Constitutional Court members will also be decreased from 17 to 15. According to the draft, the next parliamentarian and presidential elections will take place on Nov. 3, 2019. The AK Party and Nationalist Movement Party (MHP) had struck an agreement over the changes to the constitution. Constitutional change -- in particular, the call for a presidential system -- has been on the political agenda since President Recep Tayyip Erdoğan, the former prime minister and AK Party chairman, was elected Turkey's president in August 2014. That election was the first time a Turkish president was directly chosen by popular vote. In the current parliamentary model, Turkish people vote for 550 members of parliament. The government is formed by a minimum number of 276 lawmakers. In the proposed presidential system, the electorate would vote for a person to form a government independently of parliament, with no need of a vote of confidence. According to the head of the parliament's Constitution Commission Mustafa Şentop, those who oppose the draft bill will have the right to object until Jan. 2, 2017.